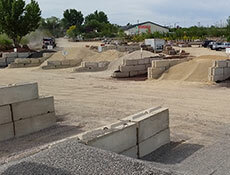 In addition to the landscaping and building stone, we offer driveway sand stone, pavers, Basalite and topsoil. Feel free to email, call or stop by to see us! Victory Greens Stone & Garden Center was founded in the spring of 1993 by Tim and Carol Mussell. With little more than hope and inspiration, Tim and Carol purchased 23 acres where the nursery stands today. 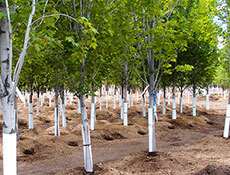 With a dream of making the place their home, they ordered 2,300 bare root trees just weeks before they were married. Tim and Carol came home from their honeymoon just in time to eagerly plant and pot the new trees. Life was good! Victory Greens Stone & Garden Center has been serving Treasure Valley since 1994. Locally owned and operated, we supply contractors and homeowners with all of their natural stone and landscape needs. We are currently open Monday thru Saturday from 8AM to 6PM. We carry a wide selection of water feather stone, flagstone, patio stone and natural landscape stone. 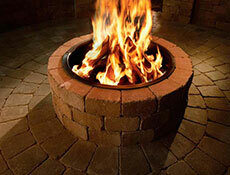 We also stock Keystone Blocks, Garden Wall & Basalite Pavers. With more than 50 bins of bulk Landscape Rock, Bark, Decorative Groundcover Stone, Topsoil and Compost priced at wholesale prices, Victory Greens is here to serve you. We also have a complete landscape nursery which carries a huge selection of large caliper Shade and Flowering trees for sale. We stock premium Layered Spruce and Pine Trees of all kinds. We also stock the highest quality Monrovia Shrubs and Topiaries for your signature landscape projects. We always guarantee the best price and we deliver. Victory Greens has also provided quality turf grasses and SOD at the absolute best price for many years. A simple phone call and we deliver fresh cut SOD directly to your landscape site. Located one mile south of exit 44 on the corner of Victory and Meridian Road, Victory Greens is in the center of Treasure Valley and easy to find. Our qualified staff is here to assist you with your design and give you helpful tips. Please come and visit us and let us serve you or call (208) 888-5551.